I can’t believe it’s already been a year since the last time I went to the Anaheim Vegan Faire! This year was the 4th annual Vegan Faire on Center Street, and I have to say I think it was the best Anaheim Vegan Faire yet! My day started out exploring the Anaheim Packing District, then I took a trolley (which is free of service on many weekends) from the Packing District to Center Street, where the main events were happening. I started off trying some vegan mac n’ cheese along with vegan buffalo wings from Clean South, a vegan southern/soul food restaurant. The wings were just the right amount of spicy, and to die for! Next, I had what was probably the best vegan cheeseburger I’d EVER had! It was from a local Orange County plant-based butcher called The Abbots Butcher. I can’t wait to order some stuff from them to cook with at home in the near future. I also stopped to eat at the Mother’s Market stand, which featured food and juice from their amazing restaurant and juiceries they have at their locations. 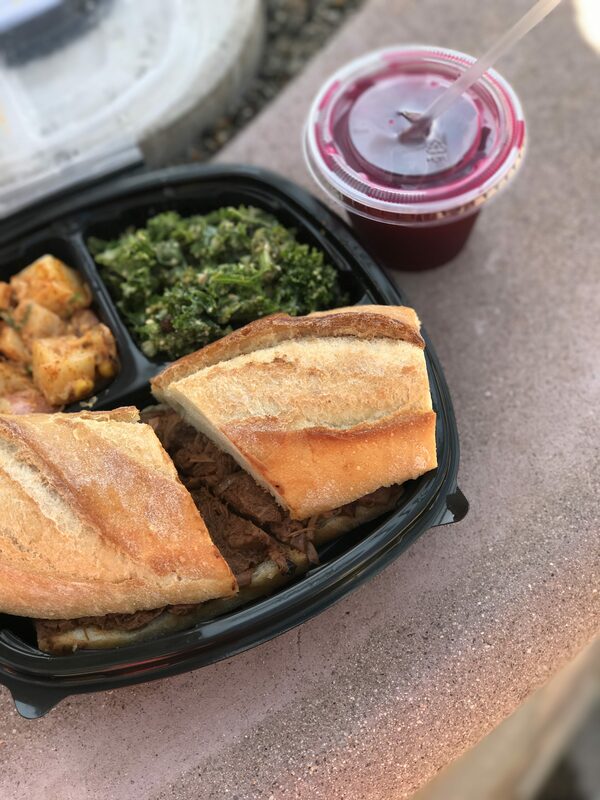 I had a BBQ jackfruit sandwich on baguette, potato salad, kale salad, and beet juice. It was all perfection, fit for vegan foodie heaven! I was so full, I couldn’t try all the restaurants, but there were dozens of Orange County vegan and vegan-friendly restaurants to choose from down Center Street! After an afternoon spent walking and food tasting, I relaxed at Center Street’s latest addition: Good Things. It is a communal space to sit and relax on Center Street, and if you care to order something they also have a beer and cider bar. This communal space looks like a hippie 1970’s living room, with plenty of vintage records and books that adorn the walls (and are even for sale if you care to buy). It was an incredible Anaheim Vegan Faire celebration, and I honestly can’t wait for next year! Even if you missed the faire, there are lots of great vegan options, such as Healthy Junk (my fave), at Center Street Anaheim and The Packing District that you can enjoy regularly! Meeting Asian Cooking Chef Katie Chin and Cooking Ling Ling Fried Rice!